The conference “Inverse Problems in the Physical Sciences” IP-Phys2015 will be held at the Center for Mathematical Modeling in Santiago, Chile, August 3rd – 5th, 2015. 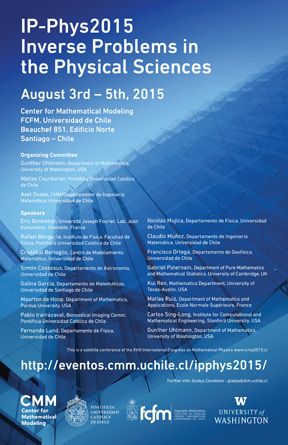 This is a satellite conference of the “XVIII International Congress on Mathematical Physics” ICMP2015, to be held also in Santiago, from July 27th to August 1st, 2015 (http://www.icmp2015.cl/). The goal of this satellite conference is to take advantage of the ICMP2015 conference, to create new connections and to enrich the interactions among researchers in the mathematical inverse problems and the mathematical physics communities, including imaging modalities, seismic imaging, cloaking, transformation optics and inverse problems in astronomy and astrophysics. We expect this interaction to be particularly fruitful for young researchers and postgraduate students working in these fields.